And they've announced a series of small tournaments to celebrate the release. 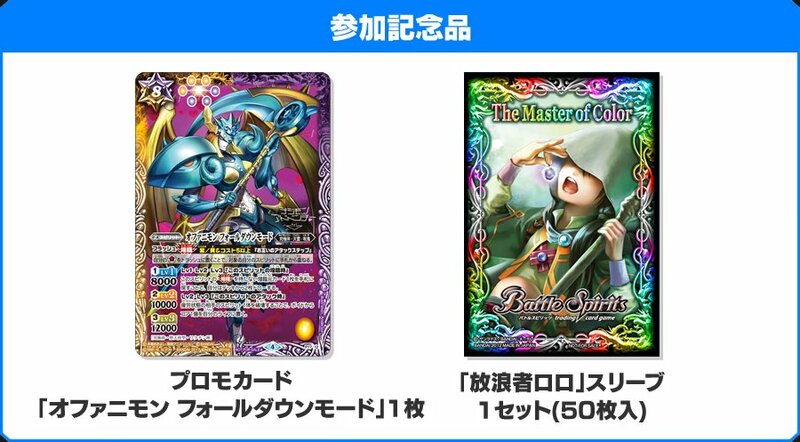 These 'Booster Draft' tournaments will take place at various stores between September 30th and October 15th. Times, dates, etc. are specific to each store, so if you are going to be in Japan and want to try, the page has a list of all the ones planned. They cost 2,000 yen to enter, and when you enter you are given 7 booster packs, of which you have to make your deck for the tournament right then. An Ophanimon Falldown Mode promo card and a set of 50 "The Wanderer Lolo" card sleeves. An A3 size (11.7 x 16.5 inches) poster of Omegamon. This art has also been revealed to be from the XXR Rarity Omegamon Card. A B2 size (20 x 29 inches) promotion poster. This is the promotional image we first saw a few days ago, and is being given to stores to promote the new set, but won't be sold ordinarily. The prizes being decent sized posters is quite nice for card tournaments. 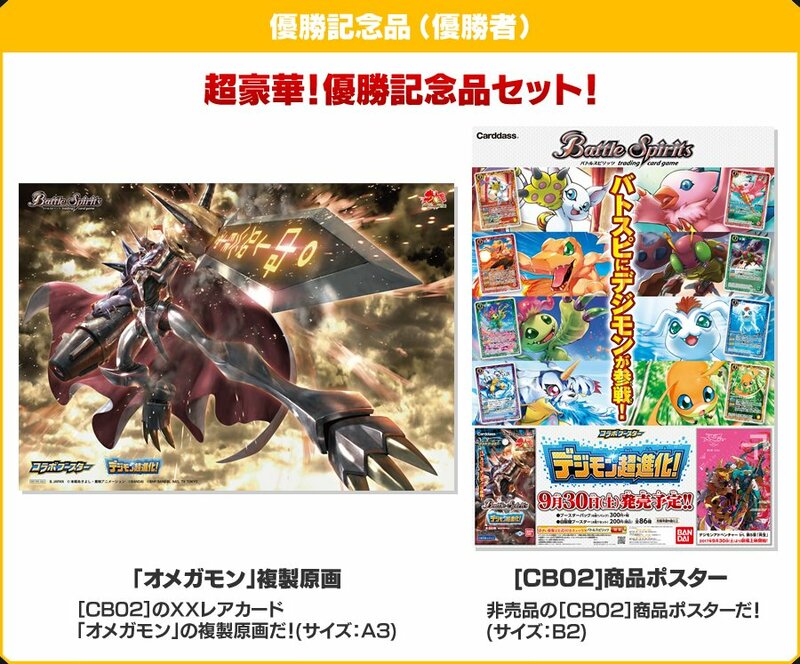 The Battle Spirits set featuring Digimon is scheduled for a little under a month from now, on September 30th. That omegamon artwork is insane, need a HQ version for wallpaper ja. I wonder if bandai will re-push his card game hyper colosseum again with the 20th anniversary set with tournaments and more often card updates also a new rule book will be welcome, right now fans from card game need create random rules for white frame cards (and gold i think) and xros wars cards also unofficial tournaments at locals (if they support the game atall). A bit sad that they are focusing on Tri (hey, give some seasons other than Adventure and Tri some love), but tecnically Orphanimon Falldown Mode came during Hunter-era. Dang I'm loving all this artwork. I'm really considering ordering a box. This is really cool too. A children's card game. Should be interesting if you could be there.